Noel Stookey (of Peter, Paul & Mary), who has encouraged my music over the years, was kind enough to endorse this album, saying, "I love the way the songs seem to blossom--not in predictable ways, yet sewn together as a seamless and soothing tapestry." This is an all-acoustic album of solo guitar pieces, some on steel-string, some on nylon-string guitars. The title piece, "Too Deep for Words," was written while I was living in Europe and feeling lonely for a girl I'd left behind back in the States. We've been married 33 years now, but I still play this song of love. 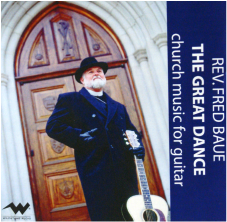 This is a collection of hymns arranged by Rev. 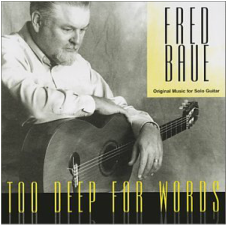 Fred Baue for solo guitar and performed by him. The hymns are ordered according to the Church Year Calendar: the Advent-Christmas-Epiphany cycle; the Lent-Holy Week-Easter Cycle; and the Pentecost/Trinity Cycle. This is the Great Dance, as it takes a whole year to complete all the steps. However, this Great Dance is echoed in the Little Dance of the Liturgy whose steps are followed every Sunday. Thus notes from the liturgy are inserted throughout: the Kyrie with the Processional; the Gloria in Excelsis with Christmas, and so on. 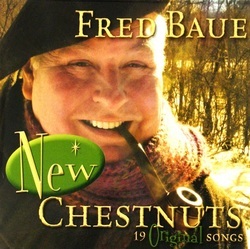 The album is also a catalog of guitar styles, from the classical ("Sleepers Awake") to country ("What a Friend") to blues ("Stricken, Smitten"). SDG: All Glory to God. That was Bach's motto, and following him I take it for my own as well. My first two CDs were comprised of guitar instrumentals. All along I have been writing songs in a variety of styles. Some have become quite popular locally. "The Last Honky-tonk in Missouri" has been picked up by George Portz and his Friends of Bluegrass, and has gotten good airplay on KDHX-FM by Fred Gumear on his Mid-Day Jamboree show. "Mary-scented Memory" is in the jazz standard vein, while "In the Hills of Old Missouri" is pure folk. There are even a couple of fiddle tunes. Not only will you find a variety of styles, but also several different vocalists, who bring their own interpretation to the songs. Please use the contact/email page to inquire about ordering this product. Hymns for occasions such as Baptism, Wedding, ect. Politically incorrect protest songs...and more!